Ring of Fire has had a remarkable journey from Broadway to theaters across the world. 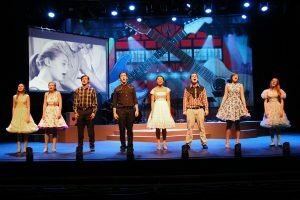 The School Edition was conceived at Ensworth High School in Nashville, Tennessee, under the direction of Donnie Bryan, featuring a cast of 28 actors and an on-stage band of 8 musicians. From the opening chords of vintage Country to Rockabilly, Rock n’ Roll, searing ballads and gentle songs of love and deep faith, Ring of Fire packs a score that provides a rich fabric in which to lay down the story of Johnny Cash. The great bio-pic “Walk the Line” told the story of the events of Cash’s life and the incredible struggles and triumphs of his life. Ring of Fire gives the music the spotlight, as a core group of talented actor/musicians celebrate the songs that are such a part of our collective experience. For Ring of Fire – Small Cast Edition, Click HERE. From the opening chords of vintage Country to Rockabilly, Rock n’ Roll, searing ballads and gentle songs of love and deep faith, ROF packs a score that provides a rich fabric in which to lay down the story of Johnny Cash. The great bio-pic “Walk the Line” told the story of the events of Cash’s life and the incredible struggles and triumphs of his life. Ring of Fire gives the music the spotlight, as a core group of talented actor/musicians celebrate the songs that are such a part of our collective experience.